J/News Articles: UK J/80 National Championships Update! 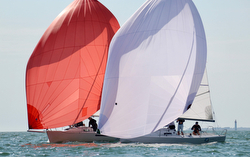 (Lymington, United Kingdom)- The U.K. J/80 Nationals will be hosted by the Royal Lymington Yacht Club from Saturday, August 18th to Monday 20th August. Preparation work for the event has entered its final stage and generous sponsorship has allowed the organizers to offer competitors an excellent on the water and social program. The Club looks forward to welcoming back the J/80s to compete in Christchurch Bay, one of the finest race venues in the UK. To celebrate their return to Lymington after a hugely successful 2016 Nationals, the Club will offer competitors the fabulous local Ringwood beer at just £1 a pint!! Lymington’s twenty-two strong J/80 fleet has been practicing hard for the J/80 Nationals- eighteen have competed in the summer-long weekly race series, with 12-14 boats routinely on the starting line. Never to late to join in on the fun! On-line entry, event information and tickets for social events can be found on the Club’s website. Add to Flipboard Magazine.